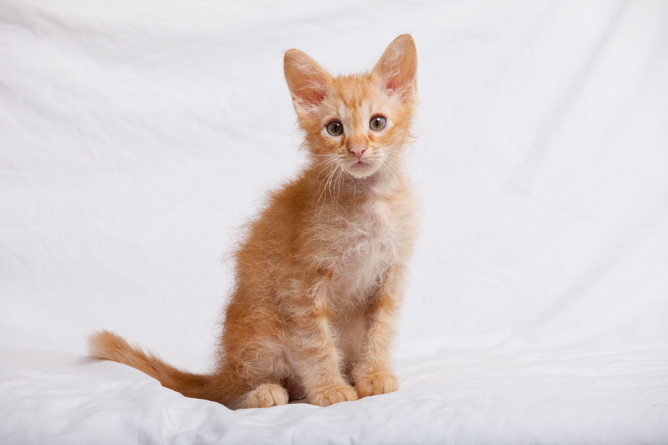 LaPerm cat breed information and advice. LaPerm cats feel as good as they look but are surprisingly low maintenance. First born in a decade when curls were all the rage, LaPerms are strikingly glamorous in any setting, whether as worthy champions or as devoted pets. Anthony Nichols, founder and chairman of the LaPerm Cat Club - who brought the first LaPerm to the UK and owns six of the breed at home - agrees: "They're really lovely cats and have such a nice temperament. LaPerms are people-oriented, from the moment their eyes open as kittens. They'll rush to meet you at the door when you get home and you can't watch TV without them joining in!" Their most stand-out feature is, of course, the curly coat. Longhaired LaPerms have the extra fluff factor, with soft, textured coats that look very similar to mohair. Shorthaired siblings hold tighter curls in their coats, offering a texture akin to lamb's wool. Despite their '80s superstar looks, LaPerms are surprisingly low maintenance and Anthony insists they only need a quick brush once a week: "All of those curls hold the hair in place, so they very rarely shed - no more than other cats. Even better, because their hair is very light and fine, when they do shed, it doesn't stick as stubbornly to furniture and clothes!" From humble beginnings as natural pest control on a cherry farm in Oregon, USA, the LaPerm's loving nature and must-touch coat has led to several breeding programmes across the globe, although the breed remains quite rare. Anthony explains: "A lot of breeders haven't heard of LaPerms, but we've noticed that once they realise how similar they are to fellow Rex breeds, they seem much more comfortable with taking on a new 'challenge'." In truth, this gentle and affectionate breed is anything but challenging. "LaPerms are moderate in lots of ways," says Anthony. "They're not extreme in the slightest. They're very eager and they like cuddles, so they're just as likely to relax on the sofa with you as they are to play. They're smart too and can be taught to play fetch." As they are still a young and fairly rare breed, it's recommended that LaPerms are kept indoors for most of the time. They should really only be allowed to wander during daylight hours, and even then, Anthony suggests keeping them in a fenced garden. LaPerms are well suited for an indoor life and make rewarding family pets. Their calm demeanours and sharp minds make them ideal around children and other animals, but they're happy in their own company as well. However, Anthony suggests: "They are fine to be left on their own if you need to be out of the house all day, but we do recommend having more than one so that they don't get bored. "You could always get another playful breed to become friends with your LaPerm. Other foreign-types work well and they get on best with Asians and Rexes." With the exception of their long or shorthaired curly coats, LaPerms are very similar-looking to their Rex cousins. They have a medium, athletic build with long legs, and - like other Rex breeds such as the Devon Rex, Cornish Rex, and Selkirk Rex cat breeds - are bred in all patterns and colours, with chocolates, lilacs and colourpoints proving the most popular. LaPerms' almond-shaped eyes can also be any colour, although colourpoints will always have blue eyes. Their medium to large triangular ears should be lined up with their wedge-shaped heads, whilst they should also feature a broad muzzle with a whisker break. LaPerms are the only Rex breed with long curved whiskers. LaPerms are quite healthy and are not known to suffer from any breed-specific diseases. However, their breeding programmes involve outcrossing with several other breeds, so ensure that those genetic contributors have also been tested for any nasties! Despite the mass of curls on their coats, LaPerms only need to be groomed around once a week and they will rarely moult. Make sure your cat's eyes and ears are clean and their nails trimmed to keep them in tip-top condition. You should look for a healthy, bright kitten with a good ear set, head type, broad muzzle and a nice coat. Some kittens may moult between four and eight weeks but their curly coiffures will fully spring back by 13 weeks. LaPerms are still quite rare so you may have to wait for your perfect kitten. There are not many breeders in the UK, but they are well spread out, so you shouldn't face too long a journey to collect your new family member. Prepare to part with around £400 to £450. The first LaPerm, Curly, was born in 1982 on Linda and Richard Koehl's cherry farm in The Dalles, Oregon. Surprised to meet a hairless kitten (some earlier LaPerms were born bald but this has now been bred out), the retired couple were even more amazed when Curly's coat grew through. Intrigued by their permed puss, they chose not to neuter her and watched their crimped colony grow over the next decade. After Linda introduced the cats to the show industry, a formal breeding programme was put in place. Anthony Nichols discovered the breed in the late '90s and brought his first LaPerm, pregnant lilac tortie and white Champion Uluru BC Omaste Po of Quincunx - affectionately known as Mosh - to the UK in 2002. The breed gained preliminary recognition from the GCCF in 2004 and the LaPerm Cat Club was formed in the same year. Championship recognition was granted eight years later in 2012, with the first cats to win Champion and Premier titles following soon after.